The Buffalo Bandits marched into Georgia on Saturday night and asserted their dominance, taking down the Georgia Swarm 19-9 on Native Heritage Night. It was Georgia’s worst loss of the season thus far, and Buffalo’s biggest margin of victory. Buffalo started off hot as Steve Priolo and Thomas Hoggarth scored within the first four minutes of the game. A power play goal near the end of the first period from Corey Small made it 3-0 heading into the second. Georgia put together a decent second period, finding their rhythm and scoring four times. Connor Sellars beat Matt Vinc less than a minute in. Priolo then scored his second before Zed Williams and Lyle Thompson scored back-to-back to cut Buffalo’s lead to 4-3. Thompson’s goal came on a penalty shot after Jordan MacIntosh was checked during a transition attempt. The Bandits answered with a three-goal run make it 7-3 with 5:26 left in the second period. Georgia would get another one by way of Zed Williams before Chase Fraser and Corey Small closed out the half. Holding a 9-4 lead in the third, the Bandits exploded with a five-goal run which really help them put Georgia away early. During the run Hoggarth and Shawn Evans each scored twice while Fraser and Small found the back of the net again. Georgia stopped the huge Buffalo run with a Shayne Jackson goal. Small’s fifth goal of the game, scored late in the third, gave Buffalo a 15-5 lead heading into the fourth quarter. After Evans started the scoring for Buffalo in the fourth Georgia went on a two-goal run with MacIntosh and Miles Thompson each finding the back of the net. Buffalo and Georgia each had one more run of two goals. That was as much as Georgia had left in the tank as Evans scored the last goal of the game with 11:37 in the fourth to secure the 19-9 win for Buffalo. “I don’t think we offered any support to either of our goalies tonight, and in this league, when you give shooters time and space either inside or outside, they’re going to score goals,” Comeau said. Part of Georgia’s issue was a deadly Bandits’ power play which went 7-8. The Swarm were 1-1. Georgia started Mike Poulin, who was lifted in favour of Kevin Orleman after Buffalo’s 12thgoal. Poulin made 34 saves on 46 shots on goal while Orleman made 17 saves on 24 shots. Matt Vinc played well for Buffalo, making 32 saves on 41 shots. 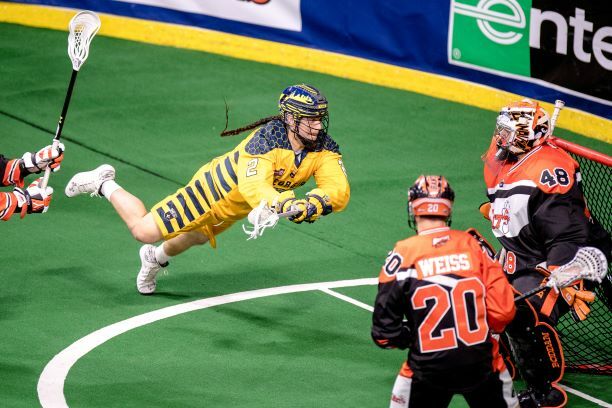 Lyle Thompson and Shayne Jackson led the way for the Swarm with four points each. Thompson tallied one goal and three assists while Jackson had 2G/2A. Buffalo was led on offense by Shawn Evans with 10 points (4G/6A). Corey Small also had seven points (5G/2A). Dhane Smith contributed an incredible 11 assists. Both of these squads will play next Saturday on February 16th as Buffalo welcomes in Calgary for a home contest and Georgia will travel out west to take on Colorado.